No business wants to spend the time or money defending a slip and fall claim, especially when most can be avoided. 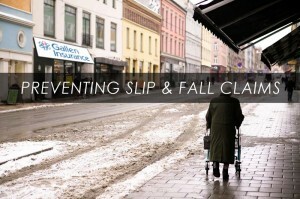 Following a few simple steps will greatly reduce your chances of getting hit with a slip and fall lawsuit. Would you feel safe driving your car without insurance? No, probably not. Make sure your business is covered with the proper insurance. Even the most diligent business owners may find themselves in the very costly position of having a slip and fall claim made against them. Be prepared. Call your insurance company and discuss what would be the best insurance plan for you. The need to maintain your place of business stems from the legal duty of care that all property owners owe to anyone who is on their property. Business owners “invite” customers onto their property and thus owe these invitees a high duty of care, which means a duty to use a high level of caution. In most states, business owners have a duty to inspect, make repairs, or warn (when repairs are not possible) regarding any dangerous or hazardous condition on the property. As long as the business owner knew or should have known about the condition, slip and fall liability can apply when an injury occurs. If you own a business that doesn’t get many visitors to the property, it’s easy to let minor repairs slide. Make sure you don’t have slippery rugs, loose carpeting, dangly wires and cords, cracked sidewalks, or darkened steps leading into your building. Pathways need to be clear from clutter. Is there a spill or leak? Clean things up and clearly mark the area to alert anyone that the area may be slippery. How does your parking lot or garage look? Is it free of loose rocks debris and potholes? Make sure snow and ice are promptly removed in inclimate weather. Even with the most thorough thought and care going into keeping your business a safe environment, accidents do happen. Follow the above tips and keep a critical eye on any potential hazards as they arise. Do your best to improve any unsafe conditions as well as you can and document your progress to lessen the odds of slip and fall claims, or at the very least, decrease their value.